Nothing says football like cheeseburgers and pick-up trucks. To celebrate these American traditions, the Dixie State University Alumni Association and The D-Crew are hosting free tailgate parties before each Dixie State home game this football season. The entire community is invited to fill their trucks and cars with their family and friends and join in the celebration as Dixie fans prepare to cheer the football team on to victory. The tailgate parties are held at the university's Alumni House, across from the Hansen Stadium at 684 E. 500 South, before every home football game from 3:45 to 5:45 p.m. 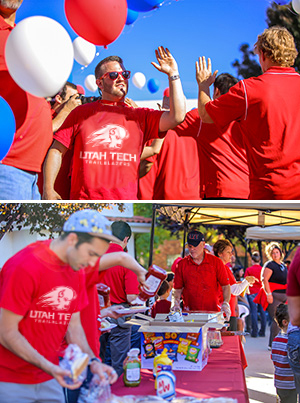 The 2015 tailgate schedule kicks off Saturday, Sept. 5, and continues Thursday, Sept. 10; Saturday, Sept. 26, which is when Dixie State will celebrate Homecoming; Friday, Oct. 2; and Saturday, Nov. 7. Tailgates offer the opportunity for attendees to cheer on the team as they walk through the party while enjoying the free barbecue. The parties also feature bounce houses, contests and prize drawings. Rain or shine, The D-Crew and alumni association will be waiting and ready to cheer on Dixie State. Don't forget to deck out your ride to win the Spirit Prize Pack at each party. The DSU Alumni Association was established in 1915 and through tailgate parties and other events, keeps all graduates connected to their alma mater. The D-Crew is a student spirit group that hosts parties and events in support of athletics. They are the rowdiest group at the games and help promote the Dixie Spirit. Learn more at dixie.edu/alumni.